This species is widespread and secure throughout most of its range across the Mississippi drainage. It occurs north to eastern South Dakota, south to northern Mexico, and in all of the Gulf drainages from the Withlacoochee River, Florida, to the Rio Grande. It also occurs in the Appalachicolan Basin (ACF basin = formed by Apalachicola, Chattahoochee, and Flint Rivers) of Alabama, Florida, and Georgia, where it was historically known from 101 records from 40 sites from the ACF system where it was once widespread including the mainstem and tributaries of the Apalachicola, Chattahoochee, Chipola, and Flint Rivers with current distribution much the same. Comments: The yellow sandshell is a long and rather narrow mussel. Because of its color and shape some of the old shellers would refer to it as the “banana boat,” while another colloquial name is “bank creeper” because it tends to crawl around. It is sexually dimorphic, with the female being slightly more bulged in appearance than the male. The female has a mantle lure to entice fish into close range to enhance the probability of glochidia encystment on the host fish. 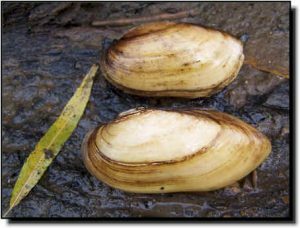 This mussel is widespread in Kansas but never reaches high densities in any location. It is better represented in southeast Kansas and is sometimes found in sparse numbers in reservoirs. 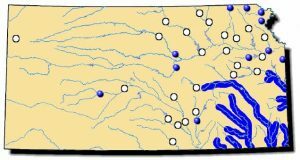 Historically, the yellow sandshell was found farther north and west in Kansas streams where relic shells can be found as evidence of past occurrence.